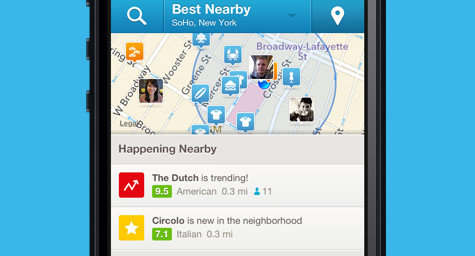 Popular location-based social networking app Foursquare currently has 54 million locations, more than 30 million users, and huge international growth. The secret to its dominance above competitors and copycats is that its users continually contribute to its database of locations, which makes Foursquare incredibly relevant to its users’ ever-changing needs. This steady stream of updated social media data ensures that Foursquare users always have the most recent information and personal opinions right at their fingertips. PCMag.com reported on how Foursquare CEO Dennis Crowley sees the app evolving and where location technology may lead in the future. The Foursquare team is currently focused on helping merchants find new customers, which was not part of the company’s original vision. The interest in bringing retailers onto Foursquare arose only after they’d received numerous requests to use Foursquare as a way to deliver promotions directly to local consumers. Now, the company has developed a business app that boasts more than one million retailers. Looking forward, Foursquare’s next goal is to become even better at mapping. The company plans to achieve this and make the social media app more valuable for search by making each person’s map more personal. These personal maps will feature overlaying social dots that recommend places each user should go based on their personal preferences and lifestyle. Mr. Crowley believes that there is such an abundance of information available that it’s now possible for each user to have a map that truly reflects their personal interests. With the trend in social media technology toward more personalized services, it looks like Foursquare is headed in just the right direction. To leverage the power of social media marketing and discover how Foursquare can expand your local business opportunities, contact MDG Advertising. MDG Advertising is a full-service advertising agency and one of Florida’s top digital marketing companies, with offices in Boca Raton and New York, NY. MDG’s 360° integrated marketing strategy uses just the right mix of traditional and digital to reach your goals. While some industries may fare better in print and others online, we strive to create a balanced approach where traditional, digital, and social media marketing efforts support each other and your marketing message is tailored to the medium. To stay on top of the latest trends in digital marketing, contact MDG Advertising. Read more at PC Mag.